With billions of people representing all demographics across Facebook, Twitter and every other network you can name, it is safe to say that social media is definitely not a fad. Your social media manager, who broadcasts your company’s voice, personality and messaging, is essentially your brand’s newest spokesperson. As countless cases of social crises have triggered downward spirals of companies’ reputations, aligning with declining sales, social media needs to be done right, however at what cost? Let’s analyze the pros and cons of both, executing your social media strategy through an agency and taking full responsibility of it in-house. 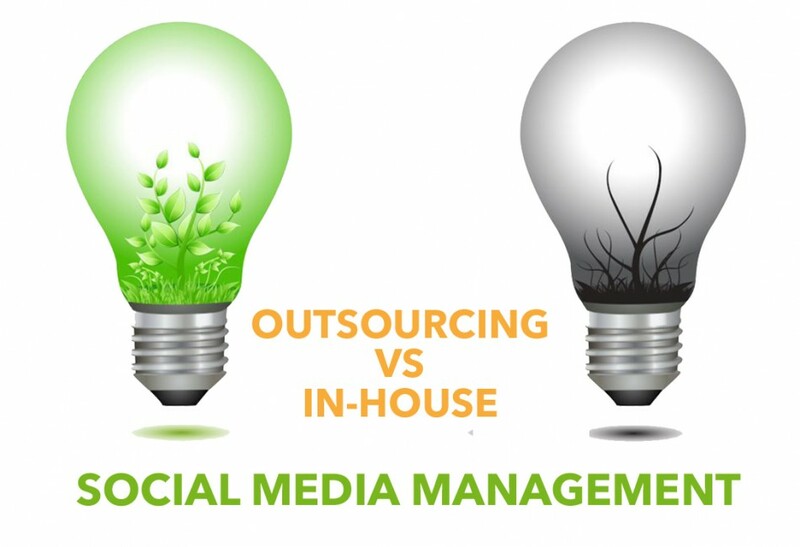 Before choosing to outsource social media initiatives, companies need to ask themselves of the monetary cost and potential of Social ROI versus hiring an intern to ‘run their social media’. It is obviously no longer a question of value, as so many companies, such as Golden Corral, have felt the wrath of a viral video scattered around social media, it now is clearly a question of how well are you able to execute your brand’s strategy online to impact your bottom line. Outsourcing does come with an experienced and strategy-oriented outlook on the platforms, but one key factor which continues to come up is correctly transmitting a brand’s appropriate voice, tone and, most importantly, personality. Living, eating and breathing social media is an agency’s job; they know how to efficiently use productivity tools, such as Sprinklr, FalconSocial and HooteSuite, to get the job done. Experience is key in social media as agencies are able to tap into the psychology of the target audience while aligning your business goals with a social media strategy. Simply put, they have been there, done that, and know what works, drives traffic, and most importantly, sells. 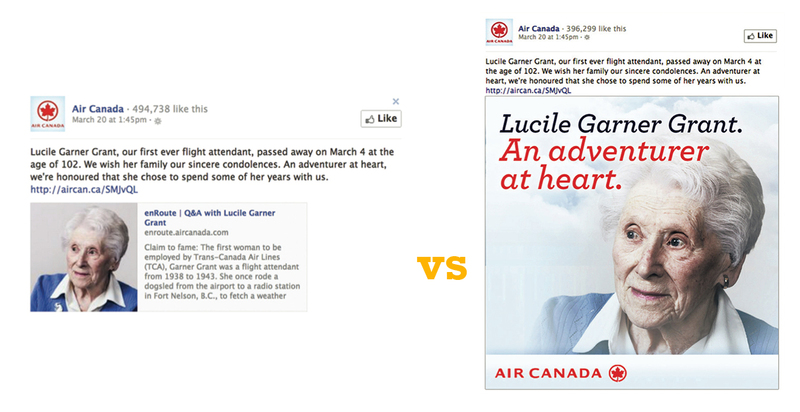 Air Canada’s very first flight attendant, who worked with the airline from 1938-1943, died, the airline paid tribute to her by posting a link to an in-flight magazine interview with her, conducted months prior to her passing. Although as touching of a story as it was, this could have been optimized to receive a lot more attention, virality and thus brand recognition. What if they have posted something like the latter of the two images? With regard to how compelling it is as an image – it would have received more attention. Unless reinforced with an experienced social media team, agencies have a leg up on knowing how to take advantage of real time marketing. A prime example of this was conceived last year as Heineken introduced its #ShareTheSofa campaign whereby ex-professional world-class soccer players were invited to their studios to answer questions asked on twitter about the Uefa Champions League (UCL) game happening at that moment. According to the company, the UCL is among the top 3 most tweeted events of the year. Heineken rode this trending topic and diverted the real-time attention towards their brand awareness. Every brand has a certain tone, image and personality. An agency simply cannot mimic the exact authentic tone than in-house marketing managers can. 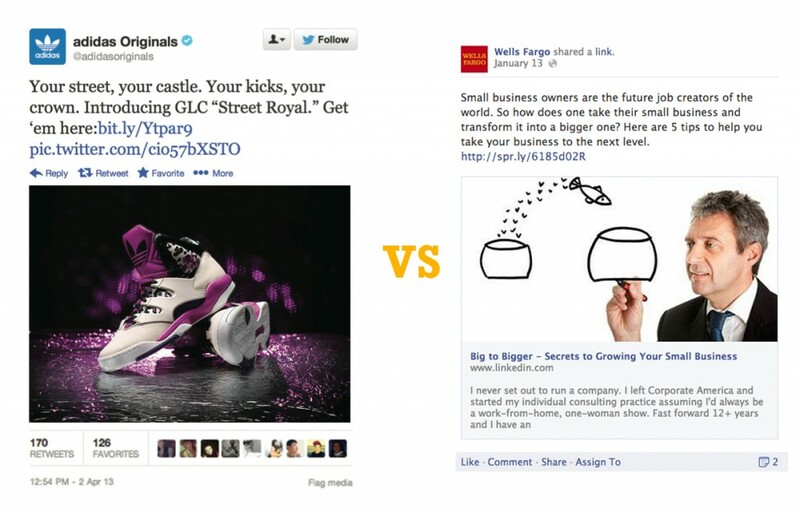 Below are two opposing brands with different brand messaging, language, style and bottom-line objectives. However, these two quality pieces of content, being both customer-focused and authentic, each brand is speaking to their respective audiences with no overlap between them. Outsourcing is said to cause, above all else, communication issues. Without the appropriate communication, there is bound to be a misalignment of vision, goals and personality. Social media is a tool to be spread across all areas of a customer-focused business, namely customer service. On-site professionals do not only understand the company’s tone and personality, they also understand their customer as well. In this case, United’s customer service reps provide real-time solutions for their customers who have run into booking issues. As well as this, as people appreciate the humanization and authenticity of social, United appealed to the emotions of its audience by humanizing its brand in the latter of the two tweets above. According to Pradeep Chopra, in his article To Outsource or Not? “While monitoring and analyzing conversations for a brand can be completely outsourced, responding to conversations especially the sensitive ones must be managed in-house. It’s very difficult for an external entity to respond on your behalf and still maintain your brand voice.” For example, HomeDepot, who was subject to a social crisis in November 2013, are said to have fired the agency and employee responsible for the bordering racist tweet they broadcasted. This type of miscommunication is very common – and thus only after a potential PR disaster, does it appear more sensible to undergo Social Media Training to bring everything in-house. Evidently, content is king, and so outsourcing community management to optimize your brand’s content natively to each platform is of paramount importance. Additionally, finding the right agency is imperative as, although many have received criticism, there are a plethora of agencies who understand the intricacies of a social media strategy and its alignment with business objectives. That said, building a stellar social media team and combining that with fully tailored Social Media Training can provide strong grounds for a structured in-house social strategy. The underlying factor, however, remains to be the cost. More often than not, the marketing budget tends to dictate whether SME and Enterprise corporations execute their social media strategy in-house or through a creative marketing agency.